Does Pasta Give You Energy? 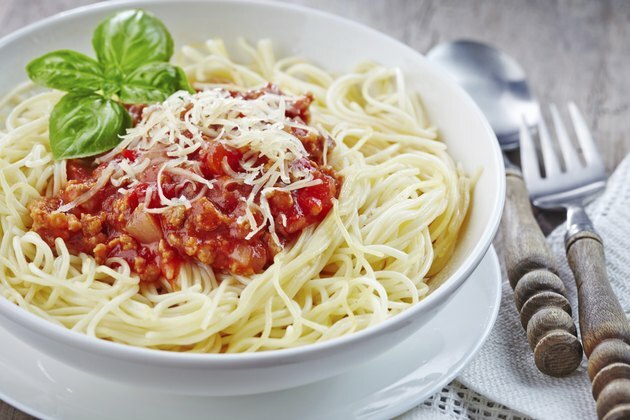 Versatile and quick to prepare, pasta is a healthy convenience food. Combine it with vegetables and a protein source like meat or beans and you'll have a nutrient-rich meal in a bowl. As a high-carbohydrate food, pasta is a rich source of relatively quick, yet long-lasting energy. Whether you need energy for weight lifting, a cardiovascular workout or just getting through the day, pasta can help you meet your energy needs. A 1-cup serving of cooked pasta contains around 45 grams of carbohydrates. This is approximately the same amount as in 1 cup of rice, but somewhat less than in a baked potato. For a balanced diet, you should aim to get 45 to 65 percent of your daily calories from carbohydrates. A cup of pasta provides 180 calories from carbohydrates. If you need 2000 calories daily, a cup of pasta supplies 20 to 14 percent of the carbohydrates you need. The complex carbohydrates in whole-wheat pasta provide more nutrients, fiber and longer-lasting energy than the simple carbohydrates in refined white pasta. When you're trying to build muscle, it's important your diet provide enough carbohydrates to prevent your body from burning protein it could otherwise use for muscle. Before a strength training workout, fuel up with a meal high in carbohydrates and low in fat and that provides a moderate amount of protein, recommends Registered Dietitian Sheri Barke with the College of the Canyons. To provide your body with energy for postworkout recovery, have a meal within 45 minutes after your workout that provides at least 35 grams of carbohydrates in a 3:2 ratio of carbohydrates to protein. For example, if your postworkout meal gives you 35 grams of carbohydrates, it should also provide at least 23 grams of protein. Endurance athletes, such as long-distance runners, may consume large amounts of carbohydrates before an event in attempt to store energy for events lasting longer than 90 minutes. To use this technique, known as carbohydrate loading, limit your carbohydrate intake to 50 to 55 percent of your total daily calories starting a week before the event. Three or four days before the event, raise your carbohydrate intake to 70 percent of your daily calories. With its high carbohydrate content, pasta can help you reach this carbohydrate-intake goal. If you eat a lot of pasta, choose both whole grain and refined varieties. Excess fiber from whole grains may cause gas, while excess refined grains can lead to constipation, warn experts from Columbia University's Go Ask Alice! service. Three hours before a strength-training workout, a healthy meal might include pasta for carbohydrates, skinless chicken breast for low-fat protein and a salad and bread roll for more nutrients and carbohydrates, suggests Sheri Barke. A little over 3/4 cup of pasta with at least 3/4 cup of kidney beans provides the amount of carbohydrates and protein Barke recommends immediately after a strength training workout. Whether or not you work out, for optimal energy from your pasta meals, combine whole-wheat pasta with a protein source such as meat or beans. The complex carbohydrates and protein in such meals sustain your energy longer than refined pasta without additional protein.